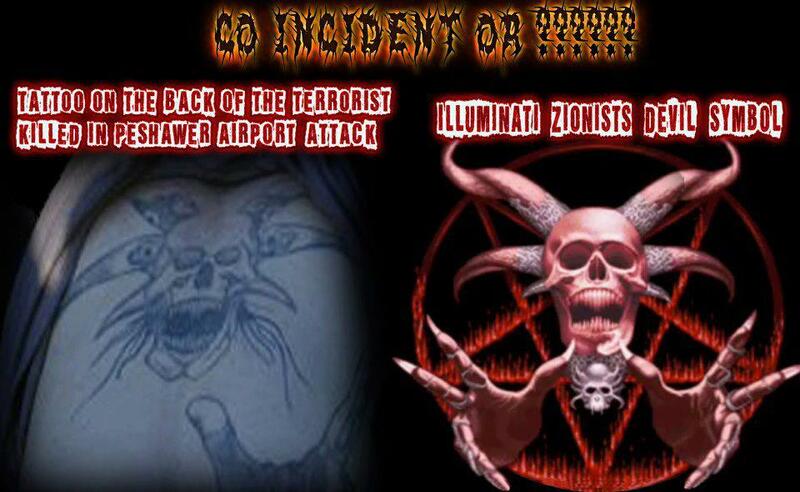 The Tattoo on that killed US marine / CIA handler is actually an exact match of Illuminati Free-masonic Tattoo. This is actually incredible proof that devil worshipers from the satanic cults are leading the war against Pak Sarzameen with the help of TZP. Now you know why we named them TZP -- Tehreek e Zalimaan e Pentagon !!!! Let us make it clear. He was NOT the suicide bomber. He was the handler who never suspected that he could be caught but was trapped by ISI in the subsequent search operation and thus killed in the firefight. Allah exposed these enemies to us now for all to see the reality of the deployed 4th Generation war. Now do you believe??? 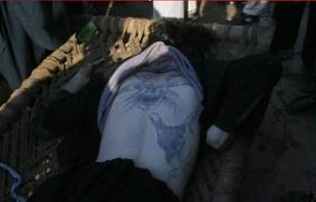 Tattoo on the back of terrorist Last night there was a terrorist attack on Peshawar airport on 16th December 2012. This is all done by external agencies under the hood operating to weaken the Pakistan as all times they attacked to Pakistan Military with advanced weapons and fully equipped and trained. About Students/Talibaan of Afghanistan who tried to build an Islamic State and wagged by states on falsehood allegations. Its very clear to World what happening right now in Afghanistan and how many bombs or missile had been fired to deliver peace in the region. and how many people had been killed during the peace on more than a decade and still how many agencies under the hood operating using fake names and they get expose after one after another. There is not a single person from us all are imaginary or fake people which are being used in media day after another they bring a new fake person who will deliver and accept what ever these agencies do against Pakistan, these all are external agencies who do not want peace in Pakistan and always hit Pakistan Military bases or point of presence. Its really obvious what Peace given to around the world by this Peace or war on terrorism or NWO. US and allies and Israel and EU have to draw a line and define what exactly they want ? Calling a very obvious thing a conspiracy theory is obviously ignorance. Who raised voice against State of Palestine is a Truth disclosed now. This is about People and People of all territory and lands have understand if they kept listening and admitting eventually they will hurt their own self and they will compromise their own future either its name of food or medicine or vaccines or media. There is so much called Obvious and Clear going on. You can not tag all or named as controversy theories. Media is tool by which countries and people are targeted by so called conspiracy theories even they are so obvious truths to people who want to know the truth before they are victim of the oppression or atrocity of the oppressor. There is always a truth under the hood when someone admit something and no one knows as the person who admits is always a delusion. This will make you understood how big liar is the media in from many decades and how easily we are invaded with thoughts that this is the truth and reality but there is so much they will never let it disclose but truth eventually have to come one day. Its only to us we admit it or always ignore it and say these are all theories and this killing and oppression is happening as its fate or they deserve or what we can do or what it could or there is nothing to us But eventually and surely The Oppressor has no rule and one day near or far people near or far have to taste the oppression. So better raise voice before its your own home under the siege or attack or on media.